The retina is a layer of nerve cells that lines the inside of the back of the eye and works like the film in a camera. It creates images that are then sent to the brain along the optic nerve. 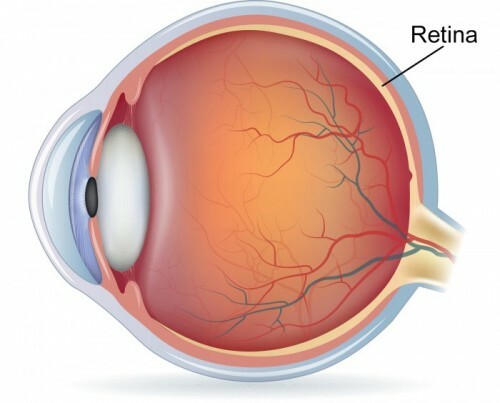 A retinal detachment is occurs when the retina suddenly separates away from the inside of the back of the eye. This is identified by an examination with a special viewing instrument called an indirect ophthalmoscope and/or using ultrasonography. The symptoms of a retinal detachment are floaters, flashing lights, and a dark curtain. Floaters are hair-like, fly-like, grey, linear structures that move with eye movement and keep moving a little once the eye stops moving. Posterior Vitreous Detachment (PVD) is the cause of floaters. If during PVD vitreous pulls on the retina, then flashing lights can appear. These lights are usually bright, white/linear, and located off to the side of the visual field. Typically, head turning or eye movement can trigger the arc-shaped flash of light. If vitreous pulling upon the retina is severe, it can tear the retina. If fluid gains access through the torn retina it lifts and detaches the retina off the inside of the back of the eye. 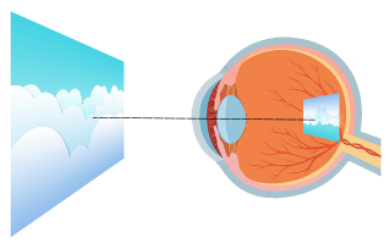 As fluid accumulates under the retina, vision is lost in the area corresponding to the area of detached retina. 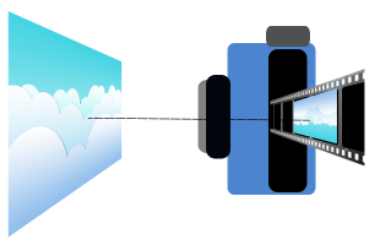 This is usually up above, down below, or off to the side in the field of vision. There is usually a curved line that demarcates the area of vision loss from the area of normal vision. It is important to have this symptom evaluated and treated as soon as possible. Treatment can be an office procedure called pneumatic retinopexy, removal of the vitreous body that caused the retinal detachment, called vitrectomy, or a sewing a plastic-like band to the outside of the eye, called scleral buckle. Here at the VMR Institute, we routinely diagnose and treat patients with retinal detachments. Because we offer state-of-the-art treatment, often not available at other eye centers, we have the ability to treat retinal detachment right in our institute. Surgeries may also be performed under local anesthesia, using suture-less techniques, with 25 gauge microsurgical instruments. This advanced form of therapy is superior to the older method (still practiced by many other doctors) and decreases operating time while increasing the speed of recovery. This surgery is done in an ambulatory surgery center, so hospitalization is not necessary. When you need the most qualified treatment for Retinal Detachment Orange County has to offer turn to the experts at the VMR Institute. Rhegmatogenous retinal detachment is caused by a retinal tear or break, which allows fluid to seep under and detach the retina. 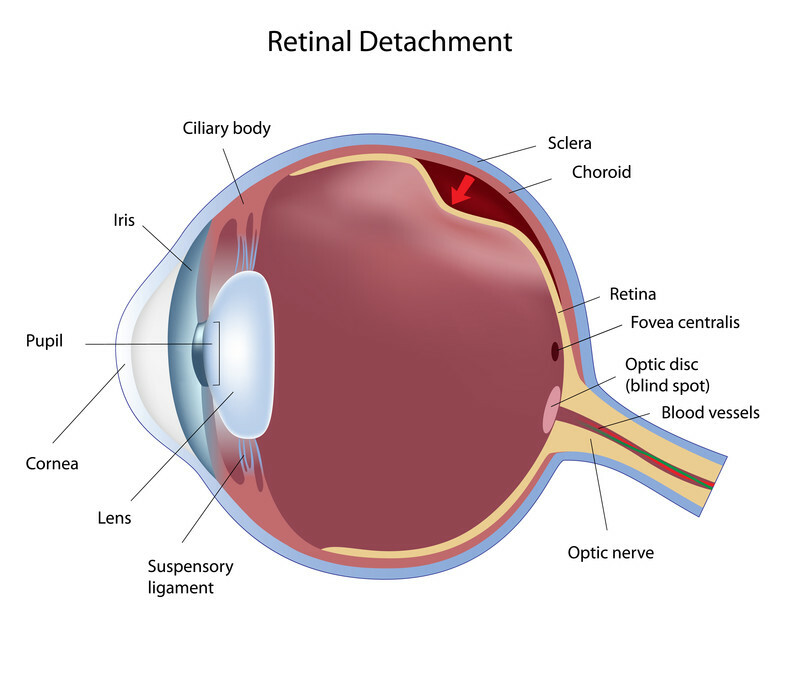 This is the most common cause of retinal detachment. this uncommon cause of retinal detachment is associated with inflammation and on rare occasions, tumors. this form of retinal detachment is due to pulling by abnormal vireo-retinal membranes associated with advanced diabetic retinopathy. If you think you might be suffering from retinal detachment and you live in the Huntington Beach, Los Angeles or Orange County area, contact us to make your appointment today. We want to help.